November 1st brought first frost, first freeze, and first snow, all in one morning! Winter is on the horizon, but there are still some essential gardening tasks to be done. Regardless of soil test results, now is the time to fertilize your lawn with one pound of slow-release nitrogen per 1000 square feet. Lime may be applied if a soil test indicated pH below 6.0. Keep leaves off your lawn, and save those leaves for composting. Any remaining diseased foliage should be removed and bagged for the landfill. Perennials can be divided and dead foliage removed. Remember that wildlife needs shelter for the winter. 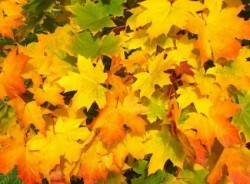 Often this is dead foliage and fallen evergreen branches, so consider leaving non-diseased foliage in place until spring. The birds, bees, and other small critters will appreciate it. Clean and oil your garden tools and equipment so they will work better and last longer. For the best return on your investment, now is the time to plant trees, shrubs, ground covers, and spring-flowering bulbs. Roots will grow through the winter, and plants will do better when summer heat returns. Article written by Diane Puckett, Extension Master Gardener Volunteer.